I recommend one of two paths for programming PICs in BASIC. You can use the professional PICBASIC Pro 3 compiler or the open source Great Cow Basic compiler. I use them both and they both have advantages. I recently created a dedicated website for Great Cow Basic to give back to that open source project. The Great Cow Basic Compiler is just like any C compiler or other language compiler. It takes the code words you type and converts them into the 1's and 0's the microcontroller recognizes and needs to run a program. This is known as compiling a program. Many early forms of BASIC, such as those run on a personal computer, will run interpreted BASIC. Interpreted is slow and gives BASIC a bad name. Professional programmers also will complain about the use of the Goto command. Great Cow Basic is different because it is compiled BASIC just like C Language is compiled. It has Do While and While loops. It has Select Case. It has many of the same commands C langauge has but in a format that is simpler to implement and remember. It's designed for Beginner's and says so in the name. Beginner's All-purpose Symbolic Instruction Code (BASIC). Great Cow Basic is very easy to use but that doesn't mean it isn't powerful. It's incredibly powerful and when used with the CHIPINO module it can create fantastic microcontroller based projects. It's also a great starting point for those that want to go further and learn C programming for the CHIPINO. I've created a dedicated site for the Great Cow Basic using CHIPINO here. The PICBASIC PRO 3 Compiler is just like any other language compiler, it takes the code words you type and converts them into the 1's and 0's the microcontroller recognizes and needs to run a program. This is known as compiling a program. Many early forms of BASIC run on a personal computer will run interpreted BASIC. Interpreted is slow and gives BASIC a bad name. Professional programmers also will complain about the use of the Goto command. PICBASIC PRO 3 is compiled BASIC just like C Language is compiled. It has Do While and While loops. It has Select Case. It has many of the same commands C language has but in a format that is simpler to implement and remember. PICBASIC PRO 3 is very easy to use but that doesn't mean it isn't powerful. It's incredibly powerful and when used with the CHIPINO module it can create 95% of what you need a compiler/microcontroller to do. 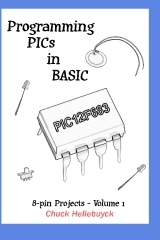 My book Programming PICs in BASIC was written for the Sample Version of the original PICBASIC PRO Compiler (version beofre PBP 3). Click on the download file below for a sample of the book.